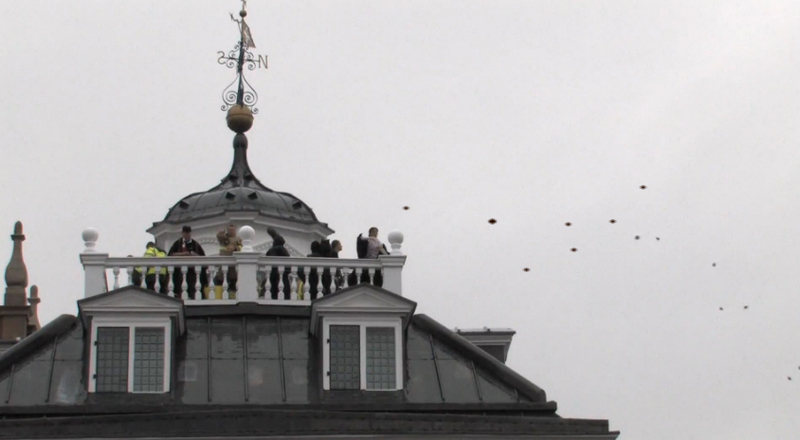 The town of Abingdon has a tradition of small bread cakes being thrown to the crowds by the mayor and town officials on certain celebration days. The bun throwing on Sunday 3rd June 2012 was in celebration of Queen Elizabeth II's Diamond Jubilee. It included bun throwing machines made by the BBC's 'Man Lab'. Abingdon County Hall Museum say that "The first recorded bun throwing was in 1760. An account by John Waite, tells how he managed to catch a cake, thrown from the Market House (County Hall) during celebrations at the Coronation of King George III. Early accounts record that cakes were distributed to the people. Yet it seems that from early on the buns or cakes were thrown. Borough Minutes of 1831 record that 500 penny cakes were distributed to the populace for the accession of King William III. The Abingdon Herald’s account of the celebrations mentions that "500 cakes ... were thrown from the tops of houses into the dirt to be scrambled for, in accordance with ancient usage". 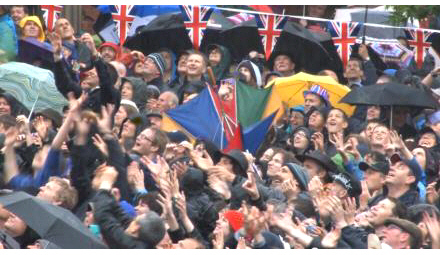 Events celebrated by bun throwing have included Royal occasions and other festivities. A selection include: 1810 Golden Jubilee of King George III, 1837 Coronation of Queen Victoria, 1856 end of the Crimean War, 1887 Golden Jubilee of Queen Victoria, 1953 Coronation of Queen Elizabeth II, 1956 the visit of Queen Elizabeth to Abingdon, 1980 the Queen Mother’s 80th Birthday, 1995 50th Anniversary of VE Day. The Museum has buns from the last 17 bun throwing. These are carefully looked after to preserve them for the future. The earliest dates from 1887 and was part of celebrations for the Golden Jubilee of Queen Victoria. A few are on show in the staircase display while others are kept in storage and brought out for exhibitions or for special appointments."